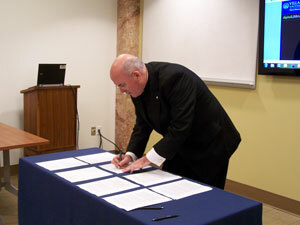 On June 19 the Reverend Edward Brady, pastor of St. Anne Parish, Phila., signed an agreement with Villanova University’s Falvey Memorial Library to digitize and add to its Digital Library historical items including a cemetery register, a photograph album and two parish histories. University Librarian Joe Lucia signed for the Library. This agreement became the Digital Library’s 15th institutional partnership. Founded in Kensington/Port Richmond in 1845, the parish is one of the oldest in the Archdiocese of Philadelphia. The cornerstone of the original church was laid on July 4, 1845. That church was replaced in 1870. Two cemeteries are adjacent to the church, which stands at the intersection of East Lehigh Avenue and Memphis Street. Two church histories to be digitized are A History of St. Anne’s Church, Philadelphia and St. Anne’s Church Philadelphia: One Hundred Years 1845 – 1945. Father Brady formed the St. Anne Historical Committee (SAHC), a diverse group of individuals who share an interest in their Irish heritage and in American history. In addition to Father Brady, Wylie and Lyons, committee members are Cormac J. Brady, Claire A. Gardner, Kenneth Milano, Drew Monaghan and J. Thomas Showler. After studying the cemetery records, the committee plans to examine and record the actual headstones in the two cemeteries. The digitized cemetery records will facilitate the committee’s study while protecting the fragile original pages. I would like to be advised when the St Anne’s cemetery records are digitized and available to the public. We normally announce a project’s completion by posting a story on our blog. We can also forward your request to the project leader. Will you please also notify me when the files are ready for public access? I have known ancestors buried there as early as 1854 and am continuing to try to find the remainder of them. Thank you. I am also researching my ancestors. I have been trying to get a hold of these records for months! I am also researching my ancestors, several of whom are buried in St. Anne’s Cemetery. St. Anne’s was my home parish till I married and moved away. My great grandfather Thomas Brady is buried that. He fought in the Civil War. My other great grandfather, Robert Stinson also fought in the Civil War along with his brothers: Company G, 69th PA. He bought a home on Huntingdon Street in the parish and lived there till he died in 1897. However, he is buried at New Cathedral Cemetery. I will be delighted to see the results of this partnership. When will these records be available. They will certainly be helpful to many who are researching their ancestors. In their bulletin last weekend, St. Anne’s announced the digitization of all cemetery records indicating they are available to all, listing the website. Unfortunately I am unable to find a way into the site. Is it because it is not yet available? In the coming months, three additional registers will be added to the collections. In particular, the owners of the cemetery plots are listed in the registers. A member of the St. Anne community is working on a map with linked data of these plots- but that is currently not available.